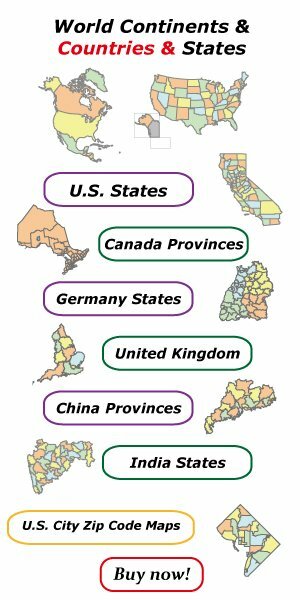 The Map of South America Template in PowerPoint format includes two slides, that is, the South America map of outline and South America political map. Firstly, our South America outline map free templates have major cities on it. 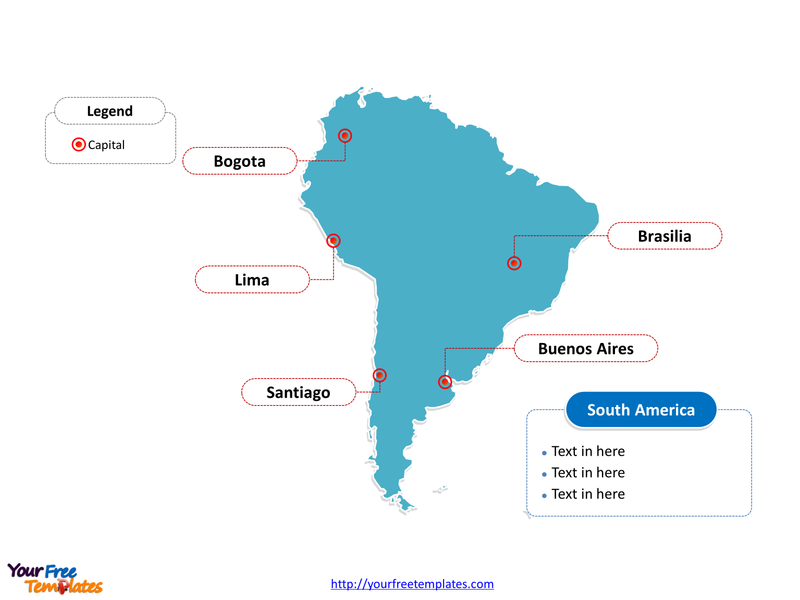 Secondly, there are 12 countries in our Blank South America map free templates, highlighting the most important countries. Our Map of South America is for the continent in the Western Hemisphere, mostly in the Southern Hemisphere, with a relatively small portion in the Northern Hemisphere. Firstly South America is bordering with the Pacific Ocean from the west. Secondly South America is bordering with the Atlantic Ocean from the north and east, North America and the Caribbean Sea from the northwest. The major cities in South America are including Bogota, Brasilia, Buenos Aires, Lima, and Santiago. 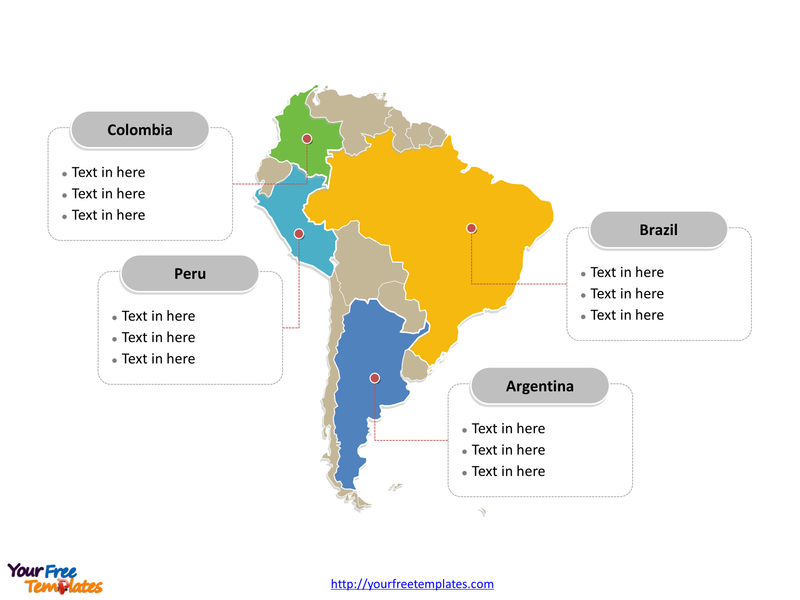 You can found them in our Blank South America map free templates. Slide 2, Map of South America labeled with major Countries. People know very well that the Map of South America is the country political division of there are 12 countries. To name them all, they are Argentina, Bolivia, Brazil, Chile, Colombia, Ecuador, Guyana, Paraguay, Peru, Suriname, Uruguay, and Venezuela. Also is a part of France (French Guiana), and a non-sovereign area (the Falkland Islands, a British Overseas Territory though this is disputed by Argentina). In addition to this, the ABC islands of the Kingdom of the Netherlands, Trinidad and Tobago, and Panama may also be considered part of South America. At the same time you can also refer to the fully labeled Map of South America in Wikipedia. The most important of all, analysts from marketing research companies, consultants from professional firms think highly of our website yourfreetemplates.com. Because our maps can help them reduce their efforts and create attractive maps.